Patients and staff were forced to flee onto the streets as a major fire swept through a leading cancer hospital. The fire broke out at the Royal Marsden Hospital in Chelsea, west London, at 1320 GMT but is now under control. Much of the roof was destroyed and a number of operating theatres were badly damaged by the blaze, which was tackled by up to 125 firefighters. Two patients and two hospital employees were treated for the effects of breathing in smoke. The hospital said two patients were having surgery at the time of the evacuation but were safely taken off their anaesthetic and ventilators and were recovering at a neighbouring hospital. Royal Marsden NHS Trust chief executive Cally Palmer said the fire had broken out on the fourth floor of the building, close to where construction work had been taking place. Ms Palmer said a "large proportion" of the hospital's five operating theatres and two wards had been badly affected, which had "compromised" its ability to perform operations. "The most important thing is that all patients and staff have been evacuated safely, and our patients are being cared for in neighbouring hospitals by our specialist teams," she said. Ms Palmer said she hoped that an area of the hospital would be available for access by 0800 GMT on Thursday. About 800 staff and 79 patients, plus a similar number of out-patients, were moved to safety from the facility, which is a world-class specialist cancer hospital. After the fire broke out several patients were laid on mattresses in a nearby street while others were led away wrapped in blankets. Many were taken to St Paul's Church in Onslow Square while others were transferred to the Royal Brompton Hospital. Chelsea and Westminster Hospital treated the three casualties. The two hospital employees were later released while the patient remains in its accident and emergency department. The London Fire Brigade (LFB) said crews would be at the hospital until the early hours of Thursday, when it hoped to hand back to the Royal Marsden for them to "carry out their business". It said an investigation into the fire would begin immediately. About 25 fire vehicles, ten ambulances and a hazardous area response team were sent to the scene after the alarm was raised on Wednesday afternoon. Dr Aled Jones, a surgical doctor, was led out of the hospital during a break between operations. "We did think it could have been a false alarm, but the message spread quickly around the hospital and we could smell the smoke," he told the BBC. Dr Jones added: "It was surreal. It didn't feel like it was really happening." He said emergency procedures would go ahead under the hospital's contingency plans. Professor Ray Powles, former head of haemato-oncology at the Royal Marsden, said the loss of the hospital would be a "huge step back" for cancer treatment. 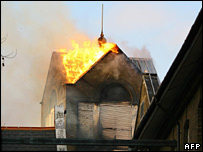 He said: "It's unbelievable what would happen if it burned down. It would be a huge, huge step back for all the patients being treated there, and a huge, huge step back for cancer." But he said valuable research material would not be lost as there was a second site in Sutton. Both Fulham Road and Sydney Street were closed as staff and patients began emerging from the hospital while crowds gathered at the perimeter to watch the scene. Patient Jason Boas was awaiting treatment when the fire broke out. He told the BBC: "All the patients and staff did not panic, and left in an orderly fashion. The staff were quite fantastic, and there was no fear whatsoever. "We were evacuated and I had my cannula taken out in a local pub by one of the wonderful nurses. We were then sent home, and hopefully tomorrow I will go back to the hospital for treatment." The Royal Marsden was the first hospital in the world dedicated to cancer treatment and research into the causes of the disease. With its academic partner The Institute of Cancer Research, it forms the largest comprehensive cancer centre in Europe, seeing more than 40,000 patients from the UK and abroad each year. 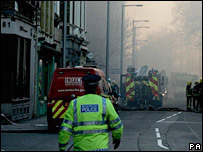 London Mayor Ken Livingstone described the fire as "a terrible incident" and paid tribute to the staff and emergency services who got patients out. "I began my working career at the Royal Marsden Hospital and experienced first hand the hard work that is done to tackle cancer," he added. Helplines have been set up for people concerned about anyone who may have been affected by the fire. They are: 020 8661 3836/9 and 020 8770 9395/9683.